The greater UCLA community celebrated Monday a man who became famous for playing a game. But more than just achieving fame for a game, baseball’s Dave Roberts said he’s determined to embody the university’s legacy by continuing to give back. 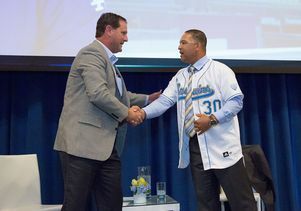 The newly minted Los Angeles Dodgers manager and alumnus returned to his home campus to a warm welcome by a capacity crowd at Covel Commons to honor a fellow Bruin for his numerous achievements and the strong character he showed on and off the UCLA baseball field. “I’ve never met someone with this much passion and love for the game,” said former UCLA baseball coach Gary Adams, who became choked up with emotion while trying to talk about his former player. 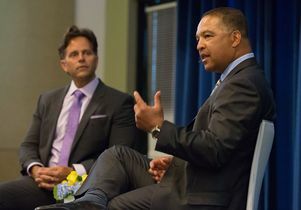 Fox Sports commentator, fellow Bruin and former Dodger Eric Karros moderated the event and also paid tribute to his colleague. “At no time did he ever not believe in himself,” he recalled. 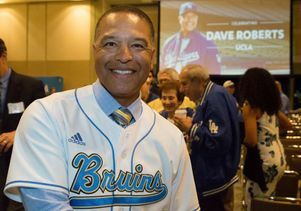 More than emblazon a mark on UCLA’s proud sports legacy, Roberts said it was the other way around: The university has left an indelible mark on him. 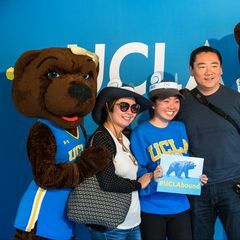 Roberts told the audience that it was his four years at UCLA that became the most important turning point in his life. The university’s legacy and values gave him a greater sense of the impact he wanted to make on his community and the world at large, he said. He is now in the unique position of following in the great Jackie Robinson’s footsteps. Like No. 42, Roberts also played for the Bruins and then the Dodgers. Now he's become the first minority manager for the trailblazing franchise. 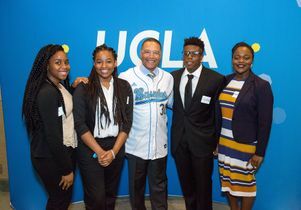 One reason why he decided to spend his day off on campus just before the Dodgers’ home opener was because he knew dozens of young people would be in attendance, he said. And they were. Brought to the invitation-only event from all over the city to meet him were young people from Weingart East Los Angeles YMCA; Esteban Torres High School’s baseball team; the Al Wooten Jr. Heritage Center; Los Angeles County Alliance Boys and Girls Clubs; Major League Baseball Urban Youth Academy; Pacoima Beautiful; and a group of exceptional UCLA students, recipients of the Jackie Robinson and Dodgers Scholarship. 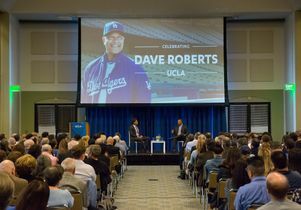 Los Angeles Dodgers manager Dave Roberts speaks to a crowd gathered at UCLA in his honor. Listening is Eric Karros, commentator for Fox Sports, a former Dodger and UCLA alumnus. During the event, the Dodgers manager sat down for an on-stage conversation with Karros, who shared some common history with him. At UCLA, both Karros and Roberts walked on to the baseball team — they did not receive sports scholarships to begin their decorated careers. They were, first and foremost, student athletes. Over the course of his baseball career, Roberts said he has tried to take a little bit from everybody who has ever coached or mentored him and melded it with his own leadership style. Making connections with people and his players is what's most important to him, he said. “I just want those young men to be better people and care for one another,” he said. One example of the compassion with which he treats his players is his relationship with Dodger firebrand Yasiel Puig. Despite the young outfielder’s reputation in the media, Roberts vowed to get to know the popular but volatile Puig for himself. They start each day, Roberts said, with a hug and handshake as a way for Roberts to let Puig know he has his back. As for the Dodgers season at hand, Roberts said it’s important to keep the players narrowly focused on each game ahead. He checks social media, but more for what his players might be saying and how his message is being portrayed in the media — the rest is noise to be shut out, he said. Roberts said he strives for authenticity of character, which he said is the only way to effectively get his message across. The Dodgers have the talent, he said; they just need to give their best every night. “Ultimately, we will win a championship,” he predicted to massive applause from the audience. 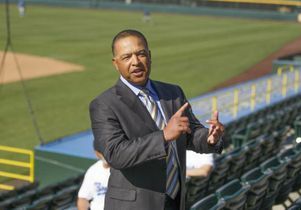 Roberts, a UCLA alumnus, is the manager of the Los Angeles Dodgers.